Have you ever see the movie Spookley the Square Pumpkin? 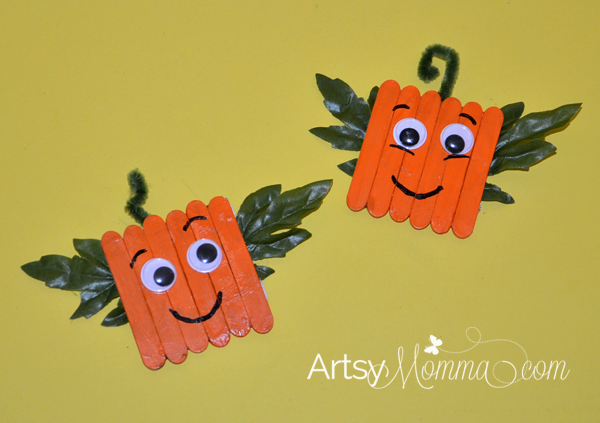 We made Spookley the Square Pumpkin craft magnets using mini craft sticks! Occasionally, we receive free craft supplies from Horizon Group. The mini craft sticks are a miniature version of the regular Popsicle sticks. 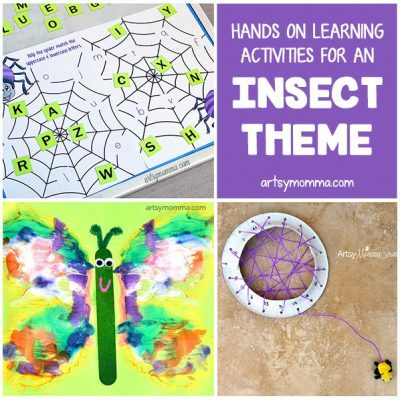 You can see them and all the rest of their products on their website CraftProjectIdeas.com including the googly eyes and fuzzy sticks also used in this post. This post also contains Amazon affiliate link to the products mentioned in this post. Please read our full disclosure policy here. Line up 6 mini craft sticks and tape it together with one strip. We used duck tape on ours. Paint the mini craft sticks orange. Let dry and add a 2nd coat. Paint with Mod Podge. Besides holding it together, it also gives it a finished look. Glue on googly eyes and draw a mouth and eyebrows using a black marker. Cut a small piece from a fuzzy stick and shape it into a curl. Glue to the backside at the top. Glue on fake leaves for the arms. If you don’t have fake leaves, no worries! 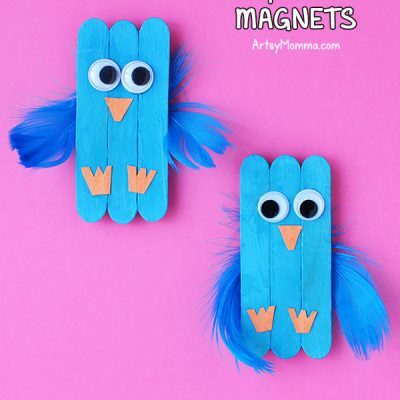 You can easily make them from construction paper. You may wish to take the tape off the backside or leave it on to make it extra strong. Add a magnetic button to the back. Display your boo’tiful Halloween art on the refrigerator using your new Spookley craft magnet! Last week, the Spookley the Square Pumpkin movie was on TV and the kids watched it. My son has seen it before, but this was Little Sister’s 1st year watching it. It’s a cute story about a square pumpkin living among round pumpkins who tease him about the way he looks. Because of this, he is discouraged to become the ‘Pick of the Patch.’ He meets a scarecrow, 3 spiders, and 2 bats who try to encourage him along the way. In the end, Spookley’s unique square shape saves the pumpkin patch. It’s a great lesson of not judging a book by it’s cover and that it’s okay to be different. 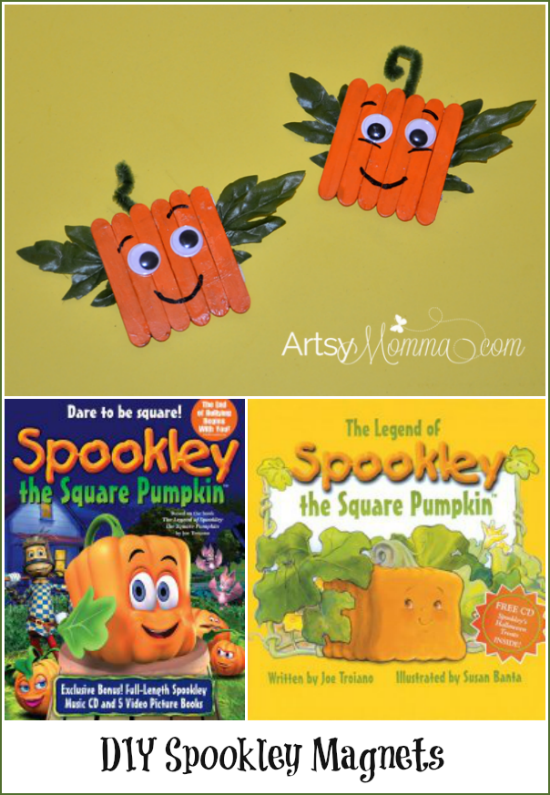 You may also like the book, The Legends of Spookley the Square Pumpkin. Thanks! Me too – LOVE all the Halloween activities!